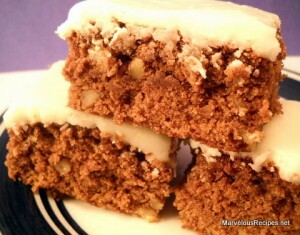 These bars will be lighter in texture than traditional brownies but incredibly rich tasting!! They are equally as delicious without the frosting. 1. In a large mixing bowl, combine softened butter, sugar, eggs, melted unsweetened chocolate and vanilla until well blended. Add sifted self-rising flour a little at a time until well blended. Stir in nuts. Pour into a greased 9×15 inch baking pan. Cook at 350 degrees for 30 minutes. Remove from oven and allow to cool. 2. While bars are cooling, brown 1/3 cup butter in a small saucepan, stirring constantly, until lightly brown. This will not take long. When brown, remove from heat and add powdered sugar, milk and vanilla. Spread on top of fudge bars. Cool. Cut into squares. Makes 12-15 squares.